Back in the spring, I knew my ten year owliversary was coming up, so I decided to knit myself a new owl sweater. 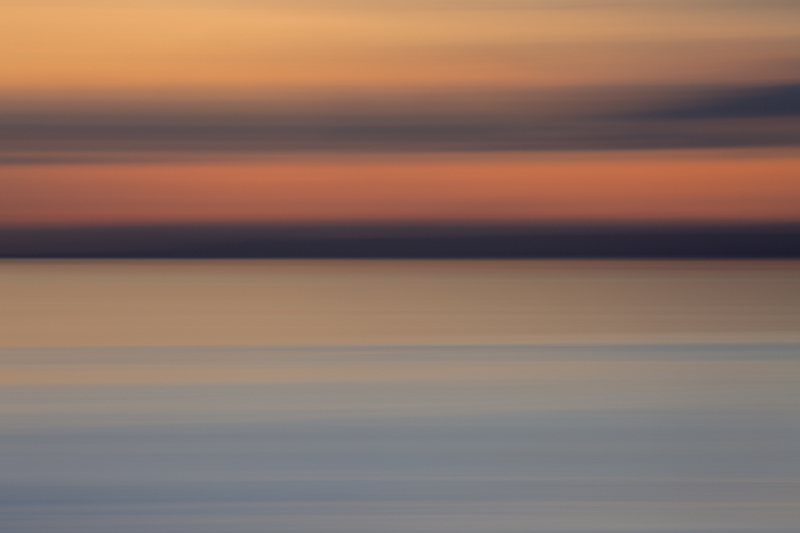 These photographs were taken while we were in Berneray, back in May. It’s quite weird seeing myself with my ‘old’ hair – I suppose that must mean I’m now completely used to the new style! Other things are new about me, too. When I designed this sweater ten years ago, I was keen on knitting (and wearing) quite neatly-fitting garments (having become somewhat frustrated with making sweaters from commercial patterns that never quite fitted me properly). I think that one of the things that made the owl sweater stand out a decade ago is that was made from bulky yarn, but did not look remotely bulky. That’s because I put waist and bust shaping at the sides and back of the sweater, and wore it with a little negative ease. The original owl sweater is still going strong a decade later, though I’ve not worn it so much over the past couple of years. One reason for this is that I definitely now prefer to wear a winter sweater with layers underneath, and a wee bit more ease. My original owl sweater was knitted in the first size, with zero to slight negative ease. This new owl sweater sample is knitted in the third size, with 4 inches of positive ease. You can see it does not fit my body in the same way – and I simply ommitted the waist and bust shaping when working this sample (just leave out steps 2, 3 and 4 in the pattern if you wish to do the same). I’m wearing two layers underneath my owl sweater here, and feel pretty comfortable. The curious thing (to my mind anyway) is that a sweater without shaping, knitted two sizes above my actual measurements definitely fits me just as ‘well’ as the original decade-old, and much more fitted sample. Or perhaps it is just that I like to wear my clothes slightly differently. And regarding the general fit of these garments on my body, it’s probably worth pointing out that I currently weigh much the same now as I did a decade ago. But what about this fabulous tomato-coloured yarn, with it’s teal and egg-yolk-yellow tweedy-flecks? 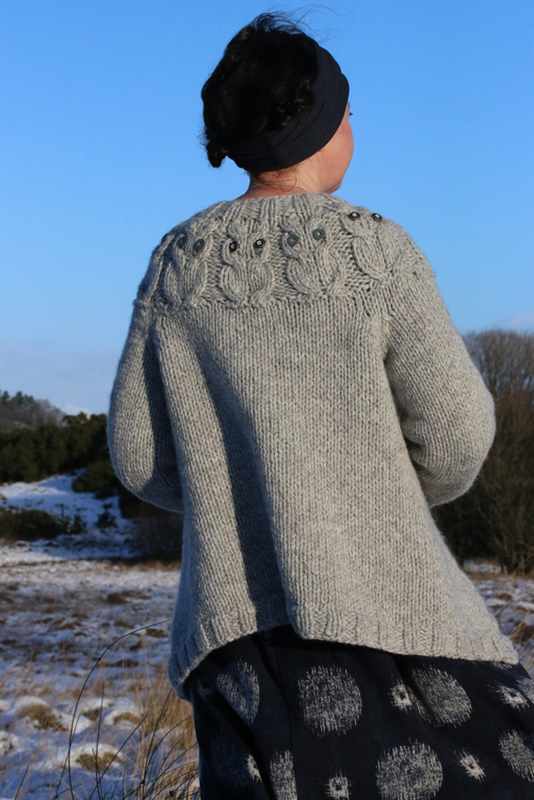 The yarn I used for my original owl sweater has been long since discontinued, but my new sample has been knitted in a great yarn that is very similar in character, and to my mind far surpasses it in quality – New Lanark Chunky. I often feel New Lanark is an unsung hero of Scottish yarn and knitting – so it is perhaps time to tell you a little more about them. Situated south of Glasgow in the beautiful Clyde Valley, New Lanark’s yarns are spun on nineteenth-century mules in a mill which, because it was the birthplace of utopian socialism, is now a world heritage site. The electricity that powers the machines comes from the mighty Falls of Clyde and an historic waterwheel – meaning that all the yarns they spin are produced with renewable energy. The yarns are woollen spun from a blend of British fleeces, and have been designed and created by Alan Baraclough. As well as being someone with a real feel for fibre and an eye for colour and blending (the tweedy palette Alan has developed for New Lanark is superb) Alan probably knows more about the processes and practices of woollen spinning than anyone currently alive in Britain (really – that’s no exaggeration). His expertise is immense, wide-ranging, and frequently sought after by manufacturers creating everything from insulation to apparel. And as well as knowing an awful lot about production, Alan is also an extraordinarily energetic and creative man, who genuinely loves designing and making yarn. Here’s a picture of Alan with the beautiful (100% Organic) tartan he recently developed from the fleeces of the Prince of Wales’ flock at Highgrove. 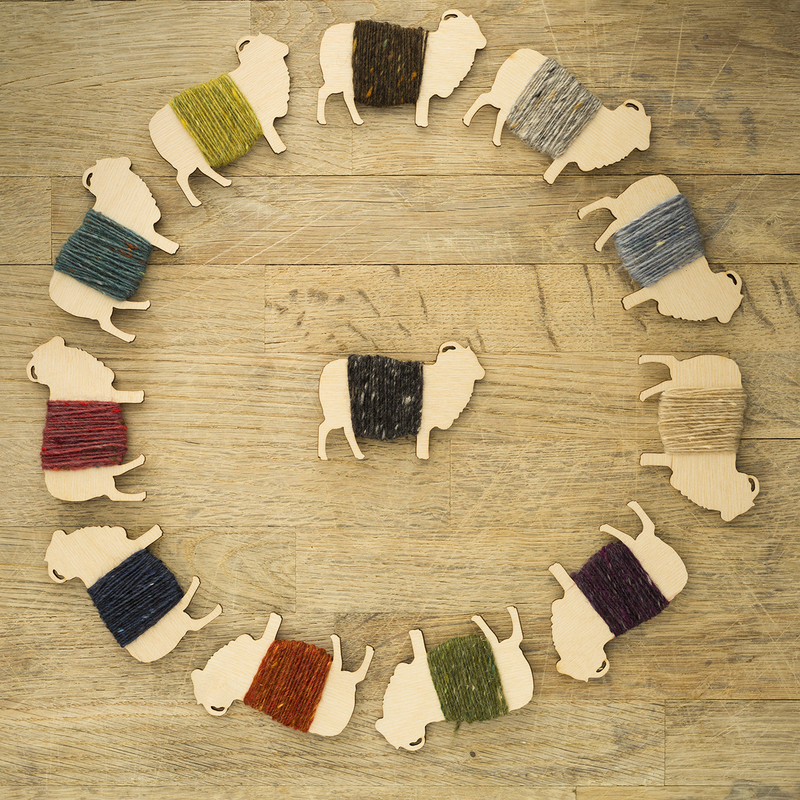 You’ll find Alan’s beautiful, complex, saturated colours in the New Lanark yarn range, alongside a group of great natural shades that he’s created. I used New Lanark chunky in my owligan sample a few years ago (above). It’s a yarn I’ve also featured in my Carbeth Swan dance pattern, and I thought it would be great to update the owls pattern with it too. New Lanark’s chunky yarn is an evenly-spun woollen-processed 2 ply. It’s robust in the hand when knitting, but it softens up considerably in the blocking, and after which it wears extraordinarily well and lasts for years. I love this yarn! This shade is called ‘Roma’ and it’s one of a number of complex, deeply saturated shades with tweedy neps to which Alan has given Italian names. Here’s Mel wearing a new owligan sample in ‘Verona’. As part of my owliversary celebrations, we’ve put together some new owl and owligan kits in New Lanark yarn, in the rich Roma and Verona shades, as well as some more subtle natural greys. Starting from just £49.00, including yarn, project bag and PDF pattern download, I reckon the kit prices are pretty reasonable. And even if you don’t fancy knitting yourself an owliversary owl, I heartily recommend exploring New Lanark’s range, and giving a skein a try (if you’ve not done so already). The yarns they spin are wonderful! And finally, if you’d like to know more about New Lanark, did you know I’d written an editorial feature for the Rowan magazine back in 2009, in which I discuss its history along with that of Cold Harbour Mill in Devon? If you’d like to read the piece, I’ve made it available for you to download. Just click the link to access the PDF. I was given your book for my birthday so it is lovely to see the owl sweater you described. The book has been a great help to me as I have read it chapter by chapter. I am now almost two years past a stroke that affected me neurologicallly rather than physically and I have related so much to your thoughts. Thank you so much for writing it. I didn’t want to read “stroke” books so I am so pleased that my sister in law, who is an avid follower of you and a keen knitter thought it would be a book that would help. And it has. Knitting has helped me through the neurological fog. Thank you so much. I’m so glad you found the book useful, Barbara – in a way, I didn’t want to write a ‘stroke book’ either! I am always on board for New Lanark love! Both the yarn range and the historical site are real treasures and whenever anyone asks about yarny places to visit in the area they are on the top of my list. My lys has always stocked their yarns so I have had the pleasure of knitting multiple items with the various weights and blends and they have all worn beautifully. Tweedy yarns are my favourite kinds of yarn and the New Lanark colours are so great. So nice to hear more about Alan Baraclough and his contributions to the textile industry in Britain. I love knowing more about the people who have been so instrumental in the making of yarns I love. Thank you for this interesting article about the resurrection of the Cold Harbour and New Lanark Mills. Through genealogical research I have learned about my Scottish ancestors, and many census records show they were employed in the wool and textile industry. I had not heard of the UNESCO New Lanark site until I read your blog. I am planning a trip to Scotland next summer and this will definitely be a stop on my travels. New Lanark is one of those places I never tire of exploring, lived close by when I was in my twenties and still feel excited to visit 25 years on. In recent years, it’s been a measure of my daughter’s walking ability, toddling along to the Corra Linn waterfall when she was very little, striding out to Bonington Bridge and watching peregrines a couple of years later (before hitting the big time and her first Munro when she was seven). Always followed by a visit to the cafe and me getting lost in the wool shop. Currently using New Lanark Dk in gritstone to knit a Finlaggan, a total pleasure to knit with. Thank for your blog and for bringing back so many memories. I’ve wanted to knit an owl since you first designed it. Today I bought the pattern, and I have yarn to swatch as well. I can’t wait to help you celebrate 10 years by casting on! Am so glad you are promoting New Lanark yarn and the mill. My husband and I stayed in one of the cottages by the river for a few days and had such a lovely holiday. I came home with two sweaters’ worth of New Lanark DK yarn. Have knitted one batch into a pullover for my husband. He loves how warm it is and what a good reminder it is of our time there and all we learned about the history of the area. Love the Roma colour and I did read the New Lanark Mill piece years ago. Thanks for the reminder. What a great job you did re working that pattern! delightful Kathy in Edinburgh a couple of years ago. I finished the back and one sleeve, but my attempt at a self-composed saddle shoulder didn’t fly, so it ended up as a UFO. Thank you for reminding me… it’s a lovely, luxurious yarn with a little silk in it, and absolutely deserves to be knitted. YAY! for New Lanark! Happy Owliversary – this sweater is now a classic! I got the original pattern for the Owl sweater when it first came out. Knit a sleeveless version for one of my daughters in the middle of a particularly long snowstorm. When your post came out, I bought the pattern- to ensure it would stay in my ravelry library! Am hoping to knit it again soon. Another of your earlier patterns I have wanted to knit for a long time now is your Deco sweater. Love the updated and older versions! I remember you writing about New Lanark Mills years ago and always hoped for a visit so when our knitting cruise docked near Glasgow, I begged (nicely) that we might visit. What a lovely place to spend the day! I ended up getting a sweater’s worth of blueberry in DK. It is a wonderful yarn to knit with and I highly recommend it. I have been a huge fan of New Lanark since a school history trip in the mid 1970s. It was then in decline and only one mill was in use, as a rope walk. During regular visits since, I have seen the housing refurbished, the mill become a tourist site and the hotel flourish. 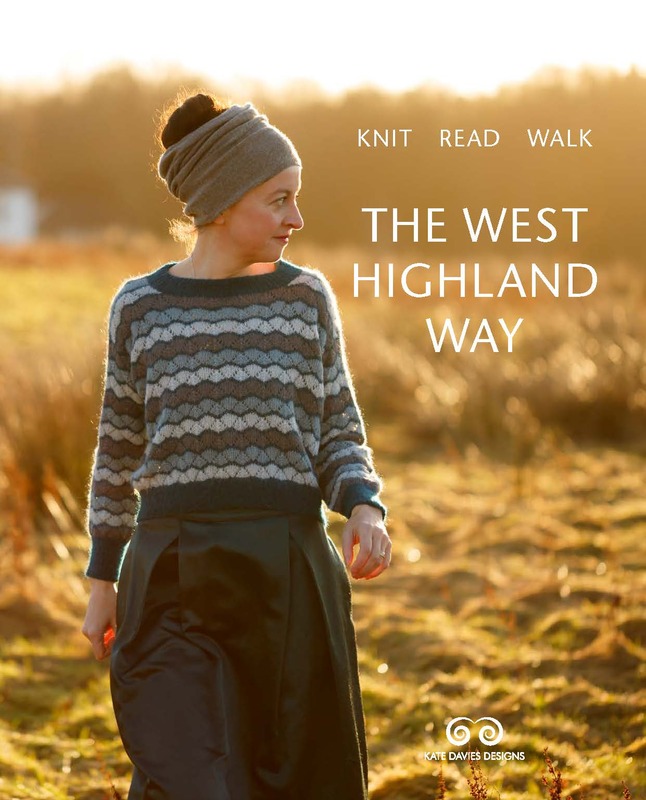 I often call in for yarn and their excellent visiting exhibitions, as a scenic (if winding) diversion towards the end of long drives from SW London to Glasgow’s southside. This excellent community enterprise is very well worth supporting by visits, or online yarn purchases. Like you I’m a fan of New Lanark yarns and feel they should be better known. Most of my own designs for Aran weight yarns are designed for the New Lanark yarn. I love the subtle heathery, and tweedy effects,which go well with my designs. I am trying to order the owl sweater but the website won’t let me select a colour. I just keep getting the radio button ‘please select’. Is there another way to order than from the hotlink? I just love your Owl sweater Kate and would really like to knit for myself. The problem is that I cannot wear chunky wool. Is there a double knitting version? If there was a double knitting wool pack I would go for it immediately. Thank you so much for all your beautiful designs, newsy emails and inspiring ideas. Very best wishes, it is always a pleasure to see your name when I open my messages. I’m a few blog posts to late to write about the owls so I won’t elaborate too much. For me the owls were also some kind of knitting/beginning, albeit in the form of a free hat pattern that I found some 5 years back on Pinterest. I knitted, frogged, knitted, frogged that thing about 10 times (having had no clue about yarn types, tension…), but I finished it and literally live in it as soon as the temp drops below 15 degrees C. From the hat I discovered Ravelry, indie knitwear designers and hup, I was onboard the magic knitting carpet. Last summer we road tripped through Scotland in our converted oldtimer firetruck and I made DH detour to spend our last day at the New Lanark site. It was as good as I hoped. We didn’t have time to visit everything but we walked on site, discovered the Clyde waterfalls walk, had coffee and pastries in the cafe were, for the first time in our three week trip, we couldn’t understand a word of the dialect the serving lady was speaking. I saved the shop for last. At first glance I was a bit disappointed…not another shop with quaint looking country stuff (sorry!) But the longer we were in the shop, the bigger the pile grew on the countertop of things we wanted to take home. And than the yarn…I cooed and touched. In the end I bought some gorgeous apricot tweedy DK that was in sale (now knitted into a carbeth) and several kilos of mills end. The yarn has indeed a will of it’s own, especially when holding 2 strands together…but the quality is amazing, and at that price! I can’t wait to visit there again and do a full tour! Those colors! Goodness knows I do not need another project or yarn, but I do need something bright and cheery for this upcoming week. Roma it is. Hi Peter, yes – without the shaping the body is rectangular – and I think the sweater knit this way would look great on a bloke – my one proviso would be to be aware that this type of circular yoke shaping tends to slope, rather than square off at the shoulders, so for broad, masculine shoulders some experimentation with sizing (perhaps going up another size or two at the yoke and upper arms) might be necessary. I heartily recommend a visit to New Lanark for all the reasons you suggest! Kate, last spring my husband and I visited New Lanark and stayed for a few nights in the hotel. It was fabulous, quite the nicest room we’d ever had in a hotel. (The New Harmony room was what we were assigned, and it was huge with wonderful views.). And as a bonus, the Great Tapestry of Scotland was being exhibited there…..it was something we couldn’t have planned but that made our trip perfect. Thanks for suggesting New Lanark. I really like how you updated the sweater! Me Too!! updated owl sweater is gorgeous!! !